After months and months of drawing and coding, This Is Star has a new look! I’ve been doing a lot of code and design on other people’s websites for the past couple months, and it occurred to me that a new look on my own site was way overdue. The previous design had been standing strong for just over 2 years, and I knew it was more than time for a change. The new site has some neat features that I’ll share with you now. I designed the site to skin the headers of various posts, by category. This way, when I make an audio post, it calls a header illustration with a cello bow and a microphone. I have similar headers for several different types of posts, and plan on adding more as my collection of post topics grows. I was inspired by the manner in which sites like Tumblr autoformat your posts by type, and I wanted to do something similar on my site, which is wordpress based. Changing the header background dynamically by category seemed like the simplest way for me to get this feel without going overboard. Seeing as I’ve grown a lot as a developer in the time that has gone by since I did my last site design, I thought I should show off some of my newer skills. 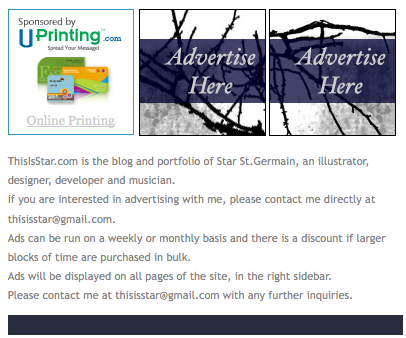 If you click on one of the “Advertise Here” buttons on the right hand side, you’ll notice that the information on purchasing ad space on the site expands below the ads. This allows me to display the information without adding an unnecessary extra page, or allowing the user to navigate away from the main content. If you hover over my logo on the top left, you’ll see that it animates slightly. 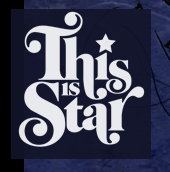 The lovely logo is, of course, designed by the equally lovely Nubby Twiglet. You’ll also notice that all my archive pages and categories will expand using a collapsing menu. This is powered by Collapsing Archives, and Collapsing Categories plugins, respectively. A web design trend I’ve seen popping up a whole lot lately is putting lots of dynamic content for social networking in your footer. I really like the look of these big footers anchoring everyone’s pages, so I decided to do my own version, integrating design elements from my category headers, as well as the site header. I hope all of you like the new site design as much as I do! The new design looks fantastic! Great website for a great lady. Awesome! The new page looks keen. I’m exploring the rest of the site now. Looks pretty damn nifty! Well done! WOW. I love your header and footer so much. Absolutely stunning. It’s a beautiful and clean, but stunning new look. Nicely done! Hey girl, just noticed my link in your blogroll! I’ll be adding you to mine shortly. Congrats on the redesign, it looks great! Thanks so much, guys! I poured literally months of my life into this, so it means a lot. It looks magnificent. I love the header illustration. as much as I loved the old site design, I’m really digging this one! I’m also glad to see you update so much more often now. Yaay!